It was a rather eventful weekend, particularly if you are a 7-year old boy (let’s call him T) with leprechauns on the brain. In my last post, I mentioned that while my husband and I were busy snacking on these Asian quesadillas with hoisin sauce, chicken and zucchini, T was busy fashioning a leprechaun trap out of a cardboard box, complete with a door propped open with a toothpick. According to T, leprechauns are not very good rule-followers. In fact, they go out of their way to break the rules (as evidenced by our leprechaun visitor…more on that later). So, T used a little reverse psychology to fool any Irish green-clad little men that might happen upon his trap. Things such as “Do not enter” and “No gold here” were etched with Crayola marker around the perimeter of the box. Of course, if you really want to attract a creature who is obsessed with rainbows and pots of gold, cold hard cash should be involved. T carefully laid a trail of pennies, starting from the top of the stairs, across the landing and into his room, right up to the door of the trap. Each day when he came home from school, T checked his trap, clearly disappointed when everything remained intact. As a show of brotherly support, my older son (M) made his own version of a leprechaun trap and tucked it away in the family room. By Saturday evening, things reached a fever pitch of anxiety. St. Patrick’s Day was almost over and, still, no sign of Irishmen of any kind. T went upstairs to take a bath while M and my husband took our dog for a walk. I went upstairs to keep T company and I swear on the Blarney Stone (okay, I don’t have even a pinch of Irish in me) that I stayed up upstairs the entire time. When T and I trundled downstairs after his bath, we were met with a shocking sight! Chairs tipped over, shoes scattered all over the living room, T’s stuffed tiger hanging upside-down from the bannister and both traps knocked over. Obviously the work of a cheeky leprechaun bent on wreaking havoc! Apparently we scared it off when we came downstairs because the boys’ piles of pennies were scattered but not stolen and the bottles of Guinness were still in the fridge. Next year we’ll set more traps and, with a little luck, we’ll catch one of those little buggers. Let’s move on to the recipe. All I will tell you is this: make it. Now, this week, next week…just soon. It must not be missed. In a medium bowl, toss chicken strips with 5-spice powder, salt and pepper. Heat a large nonstick skillet over medium-high heat. Coat with cooking spray. Add the chicken and cook, stirring occasionally, until the chicken is cooked through. Remove the chicken from the pan and set aside. Wipe the pan clean, coat with cooking spray and place over medium heat. Add the zucchini and red bell pepper, and cook until just tender. Spread 2 teaspoons of hoisin sauce on each tortilla. Heat a medium-sized skillet over medium heat. Lay one tortilla (with hoisin sauce) in the skillet, and cover half of the tortilla with a quarter of the chicken, zucchini, bell peppers and 1 tablespoon of mozzarella. Fold the tortilla over the filling and cook until golden brown, 3 to 4 minutes per side. Remove from pan and cut into 3 pieces. Repeat with remaining tortillas and fillings. Serve. 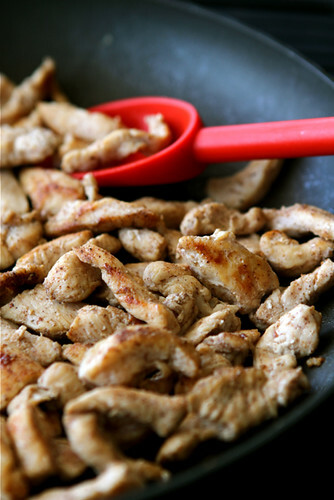 In a medium bowl, toss chicken strips with 5-spice powder, salt and pepper. Heat a large nonstick skillet over medium-high heat. Coat with cooking spray. Add chicken and cook, stirring occasionally, until chicken is cooked through. Remove chicken from pan and set aside. Wipe the pan clean, coat with cooking spray and place over medium heat. Add zucchini and red bell pepper, and cook until just tender. Spread 2 teaspoons of hoisin sauce on each tortilla. Heat a medium-sized skillet over medium heat. Lay one tortilla (with hoisin sauce) in the skillet, and cover half of the tortilla with a quarter of the chicken, zucchini, bell peppers and 1 tablespoon of mozzarella. Fold the tortilla over the filling and cook until golden brown, 3 to 4 minutes per side. Remove from pan and cut into 3 pieces. Repeat with remaining tortillas and fillings. Serve. Oh, boy, sounds like he got excited about catching one! 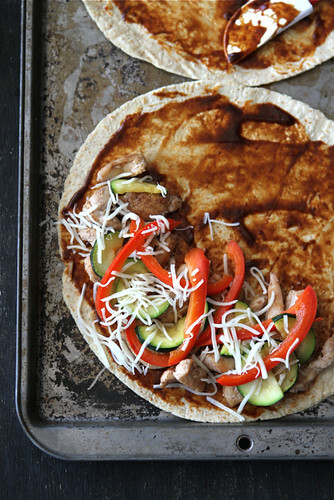 Love this twist on the quesadilla! You’re right. I must make this. asap. Looks so delicious! 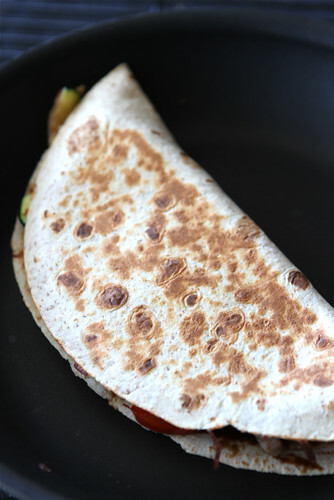 Quesadillas are on the menu a lot at our house and I know we will be trying your version soon. YUM! Loved the story of T & the trap, too cute! ABSOLUTELY love this. My life craves it! That is too fun! I would have loved to see his face!! 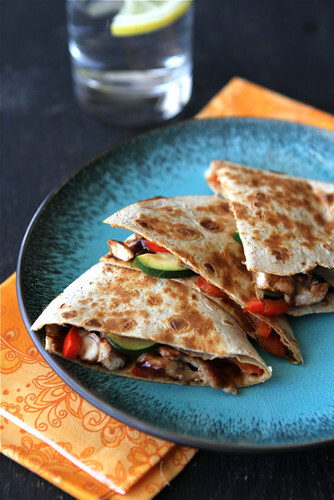 And I would love to be the one snacking on one of these quesadillas – these are right up my alley! 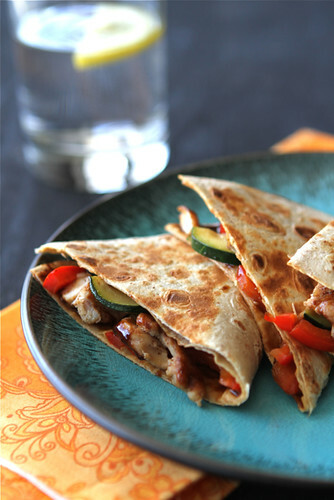 I’m ALWAYS looking for new and creative quesadillas, these look delish! 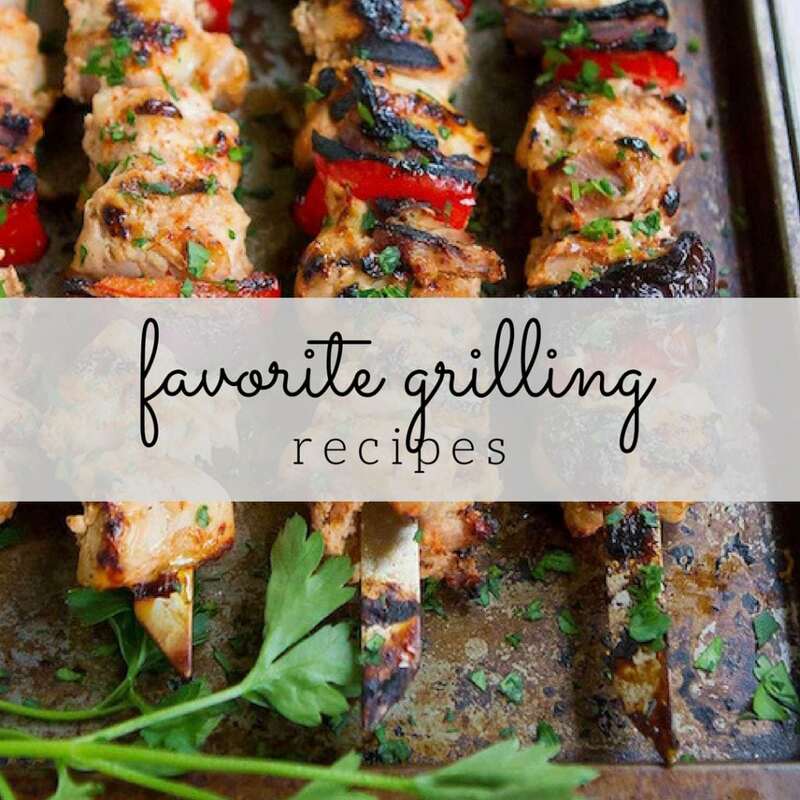 Hoisin sauce makes these irresistible! I can’t imagine a leprechaun who wouldn’t love them. Looks amazing! Thank you for another great recipe to use when our zucchini crop explodes 🙂 Fantastic Pics!!! I so rarely think to make quesadilla, but it’s such a wonderful way to feature other ingredients (veggies, meat, or seafood). This looks so lovely! 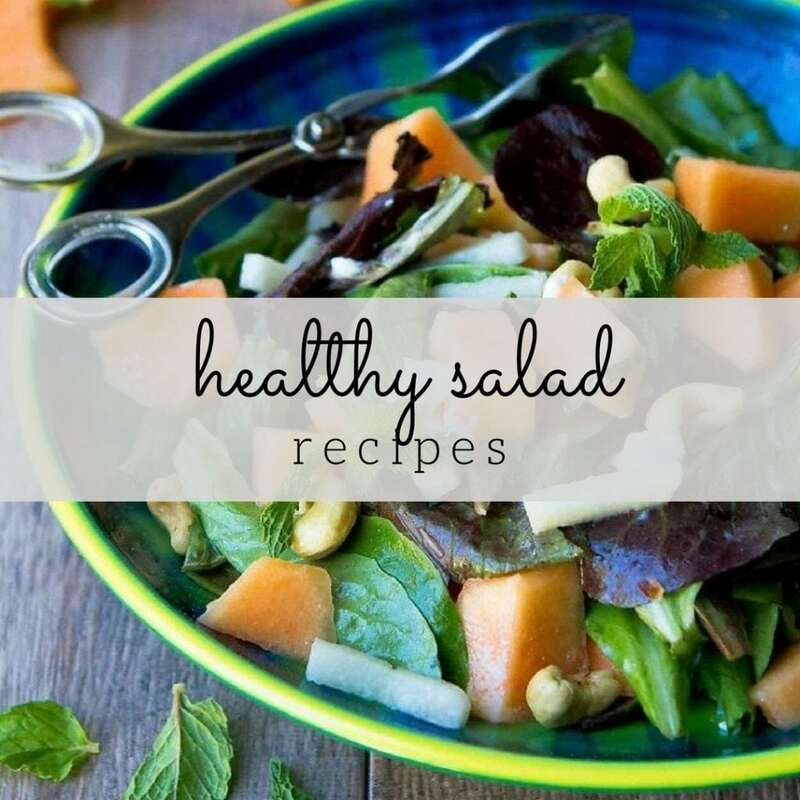 Love, love, love this….what a nice healthy meal! I love hoisin too…could just lick it off my plate. Love the leprechaun stories my boys now 10 & 11 are too big…but every St Pat’s morning I had the furniture flipped, toilet water green and Lucky Charms spread everywhere the good ole’ days. Loving how jam-packed full of flavors these are! Those leprechauns are crafty little monsters, they made a mess of Smudge’s room too and then to her delight they also jacked up my last blog post! Seriously! Your quesadillas look delish, the colors are so inviting! My family LOVES quesadilla! I wonder if I can sneak some veggies in like this and still have them eat it? A. that story is so cute! B. I am totally making these! They sound perfect! Such a great lunch idea! What a great recipe got to try this one I am sure if you and hubby both loved them they got to be awesome! Dara – I love the sound of this! I think my kids would enjoy this too. Yum, sounds like a very tasty quesadilla variation! I bookmarked this recipe. It looks fabulous and I can’t wait to try it!! That was one feisty and wiley leprechaun! Too cute!! These quesadillas look great, and healthy. Trying them this weekend – thanks! I want one of these quesadillas! Love the leprechaun catching story, too cute! I’m saving this one to make soon. We love making your Braised Country Style Pork Ribs in Ginger Ale & Hoisin Sauce – I’m 100% certain we will love making this. How in the 25 years of my life have I not thought to try spicing up the quesadilla?! I blame living in Texas. Yum! Ooo how zesty and full of color! These looks scrumptious, Dara! Scrumptious! How yummy those look. My husband would love them. Come visit us. We are having a great giveaway. 3 charm bracelets from Cutey. One of them could be yours. They are terrific. what an awesome quesadilla! definitely bookmarking this! I love the Asian flavors in this Mexican fave…Gotta try this weekend! Dinner tonight. 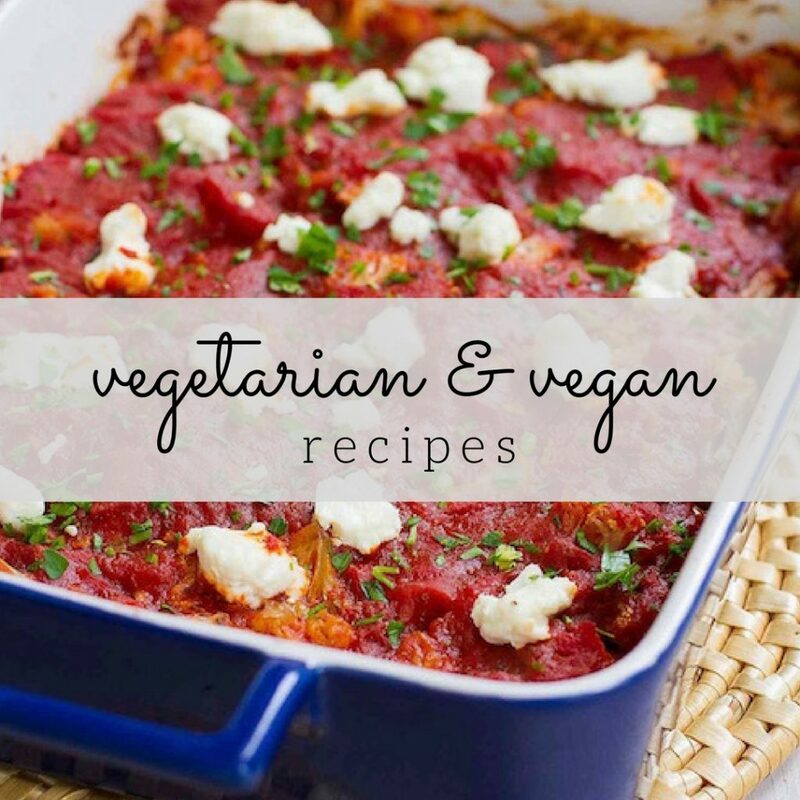 Yummy – and I love adding a new dimension to my cooking (new spices and flavors) without a bunch of fat and calories. Thanks!